How Does a Home Inspector Inspect a Gas Forced-air Furnace? Industry standards of practice state that an inspector should open accessible panels to inspect installed heating equipment. The inspector is supposed to describe the energy source used to create the heat, as well as inspect the heating equipment, venting and distribution systems. 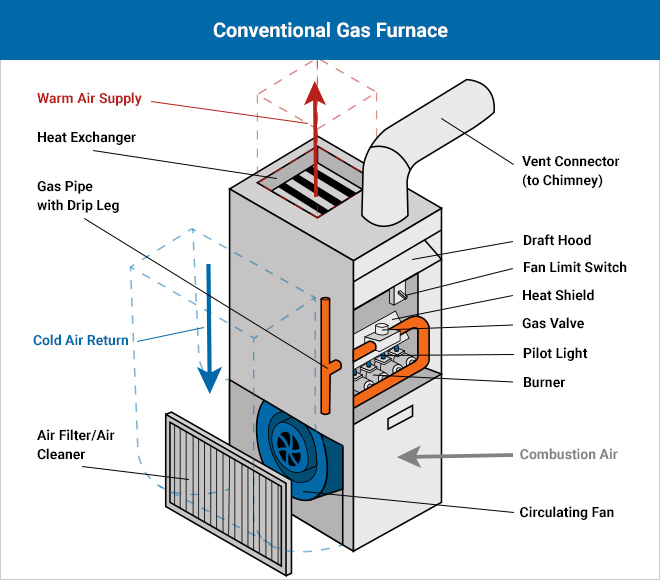 Here is the standard process for inspecting a gas furnace system. Of course, depending on the furnace type and manufacturer, the process can vary and may include additional inspection points. 1. Locate the thermostat(s) to operate the system. The thermostat should be centrally located in the house and away from other sources of heat. 2. Examine the exterior of the furnace for rust, corrosion, soot etc. 3. Use a gas sniffer on all visible gas lines joints and connections. 4. Identify the furnace, and note the serial number, age and input BTUs. This information is often found inside the burner panel. 5. Remove the draft shield and examine the burner heads, combustion chamber, and verify that the correct piping is used for gas supply. Replace the shield and panels when complete. 6. Note the color and condition of the flame for a proper burn. 7. Inspect the flue for gas leaks, rust, corrosion and proper clearances from combustibles. 8. Note any unusual noise or vibration from the blower fan. 9. Note any unusual odors. 10. Check the blower fan and filter for cleanliness. 11. Use the gas detector at the nearest supply register to check for any leaks. 12. Make sure the furnace is located in an area that provides ample air supply and has adequate room for service access. 13. While the unit is running, check for air delivery in the rooms. 14. Complete an overall inspection of the ductwork. As with all elements of a home inspection, the inspection of the furnace inspection is visual and noninvasive; however, normal service panels are removed to inspect the furnace. A thorough inspection of the heat exchanger is not in the scope of work for a home inspection, so don’t be fooled by inspectors who tell you always inspect the heat exchanger. The furnace’s data tag information can be included in the report, as well as the unit’s BTUs, manufacturer and age of the unit. Photo documentation of the furnace also should be included in the report. If issues are discovered, then the home inspector should recommend further evaluation and repairs as needed by a qualified heating contractor.